Periodical published in Philadelphia by Isaac Leeser. It appeared first in April, 1843, and was continued as a monthly until March, 1859, inclusive, making sixteen volumes in that form. In April, 1859, it appeared as a weekly, continuing as such until March, 1861. In April, 1861, it returned to the monthly form; it continued so until 1869, when it ceased to exist. Twenty-six volumes in all were published. Isaac Leeser died Feb. 1, 1868; and the last volume appeared under the editorship of Mayer Sulzberger. In its day it was the leading Jewish publication in the United States with world-wide standing. Much of Leeser's work was first printed in "The Occident." Among the noteworthy publications which first appeared in "The Occident" were the translation of De Rossi's "Dictionary of Hebrew Authors," by Mayer Sulzberger, and a series of twenty-eight letters, on the "Evidences of Christianity," by Benjamin Dias Fernandes, later published under the title of "The Dias Letters." 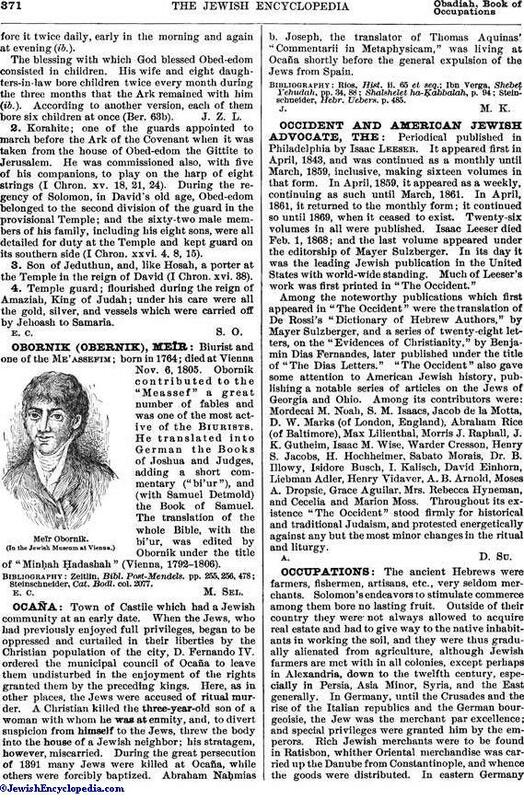 "The Occident" also gave some attention to American Jewish history, publishing a notable series of articles on the Jews of Georgia and Ohio. Among its contributors were: Mordecai M. Noah, S. M. Isaacs, Jacob de la Motta, D. W. Marks (of London, England), Abraham Rice (of Baltimore), Max Lilienthal, Morris J. Raphall, J. K. Gutheim, Isaac M. Wise, Warder Cresson, Henry S. Jacobs, H. Hochheimer, Sabato Morais, Dr. B. Illowy, Isidore Busch, I. Kalisch, David Einhorn, Liebman Adler, Henry Vidaver, A. B. Arnold, Moses A. Dropsie, Grace Aguilar, Mrs. Rebecca Hyneman, and Cecelia and Marion Moss. Throughout its existence "The Occident" stood firmly for historical and traditional Judaism, and protested energetically against any but the most minor changes in the ritual and liturgy.